Arrow Sewing Cabinets: Twice The Likes, Twice The Fun! 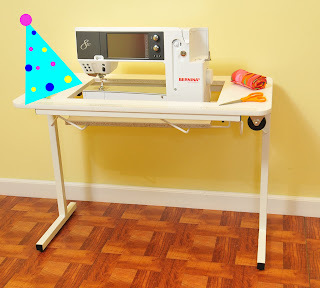 In just a little bit, we'll be giving away an entire sewing suite to celebrate over 5,000 people liking us on Facebook. We have had such a great time interacting with you over the past year or so! You're the best fans around! You're always good for a giggle, you share all of your great projects with us, and you're always so enthusiastic. THANK YOU! Every time we add 500 fans on Facebook, we'll be giving away not one, but TWO Gidget II's - one to a lucky fan, and one to a local Arrow dealer or quilt store that the winning fan chooses! Like always, once you've filled out the online registration form located on our Facebook page, you are automatically entered to win the giveaway. No need to keep re-entering! Once again, thanks for all of your support this year, and we hope you stick around for 10,000! *Contests are only open to U.S. residents residing in the 48 contiguos states. Residents of Canada are eligible, but will be responsible freight, duties & taxes. Please, only one entry per household. Such generous people!!! Thank you for everything you do!! wow! that's so cool! I love the way your cabinets look and dream of the day I can get one of my own. I just read the small print. Only in the U.S.? Sorry, but since you don't count us Canadian and other foreign fans, you won't be celebrating 5,000 as soon as you had hoped. I'll be "unliking" and letting all my friends know that we're not included. Lisa-jo, thanks for bringing this to our attention. We DO include Canadian residents, but they must pay the associated shipping costs, duties & taxes. Sorry, but these costs are extremely prohibitive, and this is common practice for many U.S. companies. We feel that we are beyond generous with our giveaways, and hope that you understand why this is necessary. I just found out about you today via, Chris Wooten, I must say, I LOVE YOUR CABINETS ...I just wish I could afford them ..it would be so great to get rid of all my MIS- matched tables and cabinets AND OUTFIT my room with these ..they are just so gorgeous...you are so generous to even offer all that you do ...God Bless and I will enjoy coming every day!! Ah, I see! I wonder what these costs entail. I never had to check that out before. I love your cabinets, and would think that any Canadian winner wouldn't mind paying the shipping if he/she won. I will definitely remain a fan, but I think you should add the full details to your fine print so that others aren't mistaken like me! Wow this is great!!!! Hope you make the 10,000 soon!!!! Thanks for all the opportunities to win!!! You're by far one of the most generous companies in the sewing world,specially seen in the current bad economic situation. I'm sure we all appreciate this very much. ALL FOR THE LOVE OF SEWING!! I have so much fun visiting your site! I'm hoping for a new Bernina 820 from Santa. If I were to win any cabinet that would be icing on the cake! Thanks for offering such generous gifts. May you all have a Blessed Holiday Season. Wow how generous you are thanks so much. good luck hope your site keeps growing. I had never heard of this brand before, but any sewing table is better than sewing on my kitchen table!